Navgraha Yantra is a geometrical design consisting of nine squares representing all the nine astrological planets effecting our horoscope. The word Navgraha is a combination of two words ‘Nav’ meaning nine and ‘Graha’ meaning nine celestial planets. 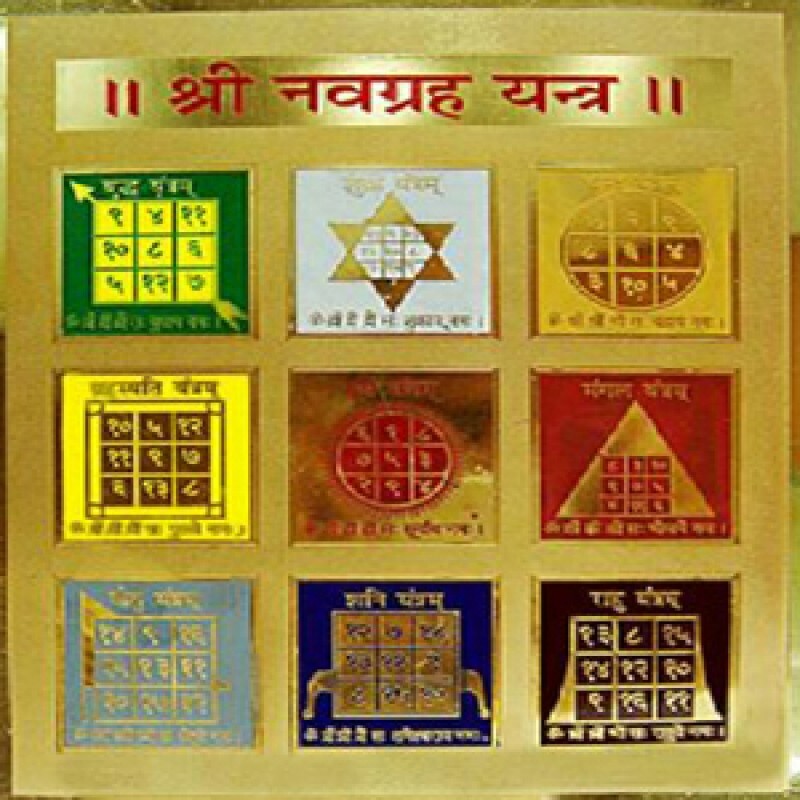 The Navgraha Yantra together acts positively on all the nine planets making it much easier for the worshipper and reducing the bad effects of these planets on our life. The nine astrological planets are: Sun (Surya), Moon (Chandra), Mercury (Budh), Mars (Mangal), Venus (Shukra), Saturn (Shani), Jupiter (Guru/Brihaspati), Rahu and Ketu. All the nine planets are placed in a big square with three rows containing nine other squares for each planet. The first row contains 3 planets- Mercury(Left), Venus(Centre), Moon(Right). The second row contains another 3 planets namely Jupiter(left), Sun(Centre), Mars(Right). The third row has Lord Ketu(Left), Saturn(Centre) and Lord Rahu(right) as planets. Every planet has nine numbers(formula) assigned to it. Every planet has its own unique shape. Keep the Navgraha Yantra at a clean and sacred corner (worship place) especially facing east or north directions. Pour holy water (water from Ganga river) onto the Yantra and pray with the incense sticks, light a lamp (Ghee) and offer sweets. Haldi as an herb has a lot of proven medicinal properties, that helps in ailments like Cancer, bone problems, cough and colds, increasing immunity and even in Jaundice. Haldi is a very auspicious herb and is hence used while performing any Hindu ritual/prayer. 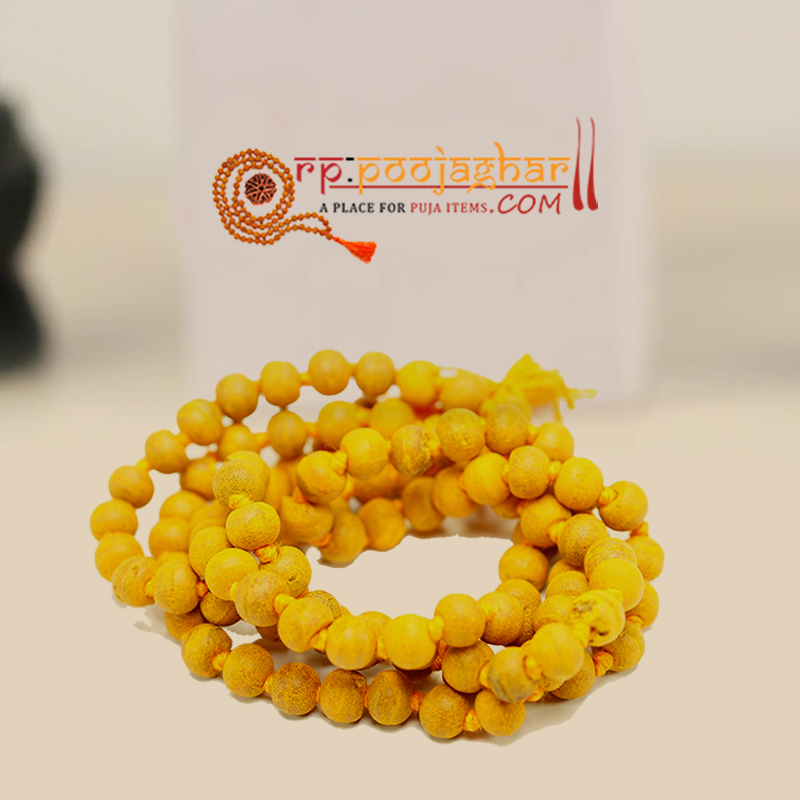 It is believed that Haldi/Turmeric mala benefits people in law suits and remove differences. It also has a positive effect on state of mind, reduce stress and tensions. This rosary is used to pray Goddess Baglamukhi. Chanting of the mantra “Om Brim Brihaspathi Namah” on Thursday with this rosary helps strengthen the lord Jupiter and removes its negative effects. Tulsi/Basil plant is a very auspicious plant/herb. It holds special place in Hinduism. It is very dear to Lord Krishna(Vishnu) and wearing a Tulsi mala is like attaining the blessings of lord Vishnu and makes you a forever devotee of the God. It is stated in many Puranas that it purifies a person’s soul by destroying all his sins and generates positivity in the wearer and keep him calm. It benefits people with bad dreams and reduces the chances of accidents. Tulsi is a great herb and wearing its rosary will have good health effects. It is used while chanting the Shlokas / verses of Lord Krishna(Vishnu). Etymological Meaning: Rudraksh (रूद्राक्ष) is a Sanskrit word consisting of the name Rudra (“Shiva, The Hindu Almighty“) and Akṣha (“Teardrops from the Eyes”), Teardrops of lord Shiva eyes. Vedas describe that Lord Shiva was so hurt and sad due to the unrighteous behavior of Demon Tarkasur’s sons that tears shed from his eyes, taking a shape of a Rudraksh tree. These fruits are also known as Amritphal (Fruits of Nectar), hence satisfying thirst. The Rudraksh fruit is blue in colour and it resembles a lot like blueberries, but it turns black when dried. The central hard seed may have 1 to 21 faces. There are 38 varieties of Rudraksh that grow primarily in Nepal, India, Indonesia and Sri Lanka. The malas are strung in groups of 108 beads, with additional 109 bead also known as the guru bead. It is best to wear certified Rudraksh to ensure genuineness. Rudraksh facilitates meditation by keeping our mind and heart calm. It improves circulation, function of endocrine glands and respiration in the body. Rudraksh increases confidence in a person due to its Bioelectric stimulation effects. ‘Siva Purana’ states that wearing Rudraksh frees a soul from bad Karma and help attain his goals. Rudraksh beads benefit all the people who want success, happiness in life, family harmony, creativity, spiritual growth and ward of any negative forces in life. It even resolves the problem of untimely death. ‘Skanda Purana’ states that even if one does not perform his/her religious duties, the Rudraksh will frees him/her from all sins. ‘Srimad Devi Bhagavatam’ says that One seeks benefit by simply looking or touching a Rudraksh. ‘Padma Purana’ states that if a person wears Rudraksh on his/her body it will multiply the fruit of good actions a million times.